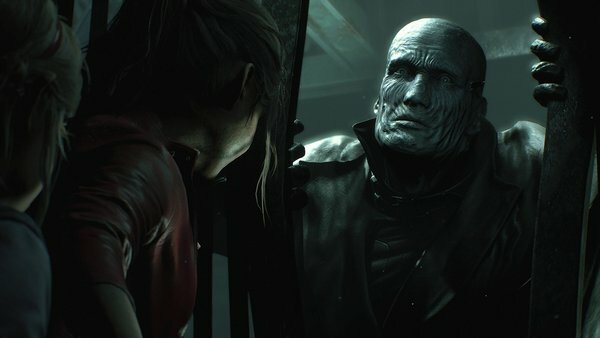 Home » Games » Resident Evil 2 Remake Review: The True Remake Done Right! 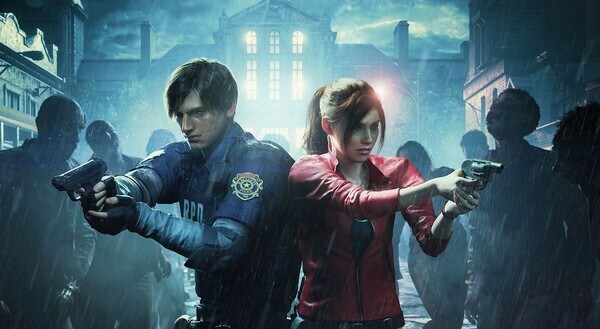 The long-awaited Resident Evil 2 Remake is finally here and it is literally one of the most, if not the most wanted Resident Evil game to date. The game has already had various showcase reveals and videos and needless to say, it looks extremely stunning. Naturally, tons of players, especially Resident Evil fans, have been so hyped for this title. So is it truly worth it? Let’s find out! In summary, Resident Evil 2 Remake (RE 2 Remake) is the remake of the legendary survival-horror title – Resident Evil 2 (RE 2) back in 1998. The game has just released on January 25, 2019 and so far, the general reception of this remade title is extremely positive. 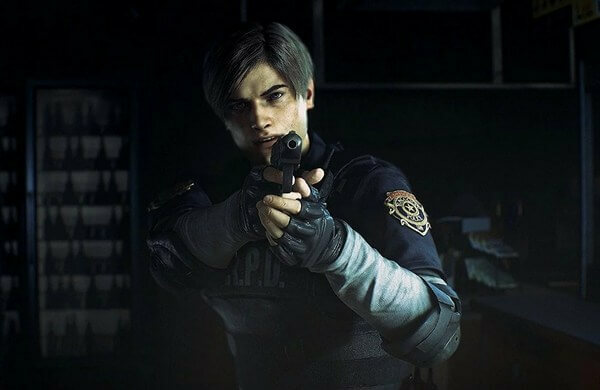 Since this is a remade game of 1998 Resident Evil 2, Resident Evil 2 Remake also adapts the same story and timeline when Leon Kennedy was just a police rookie, not a badass agent he is now in recent RE titles. The story takes place in Raccoon City in 1998 when Leon begun his first day work. Here, he also met Claire Redfield and soon, the two found the city was already in hell. It was swarmed by the zombies and so, they split paths and tried to find a way escape this city. 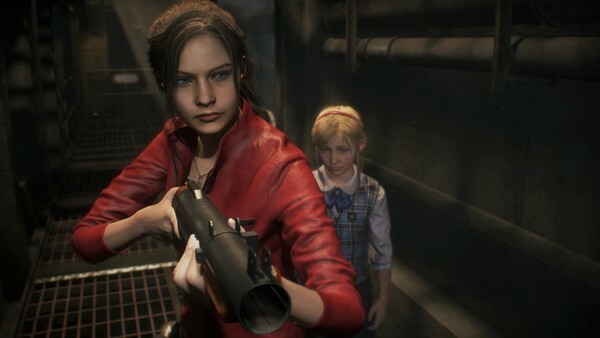 According to director Kazunori Kadoi, Resident Evil 2 Remake will have two main campaigns: one for Leon and for Claire. Each campaign will take around 10 hours to beat, which means it will take about 20 hours in total to complete the game’s main storyline. That is a good amount of play-time given the nature of survival-horror games like Resident Evil 2. And now, it is time to enjoy this remade hell and see how well Capcom recreated this old legacy. One thing many people are worry nowadays is that when a trailer or showcase video is released, it actually does not represent the actual quality of the final game. This has been a case for many titles like the 2014 Watch Dogs and the 2016 The Division. 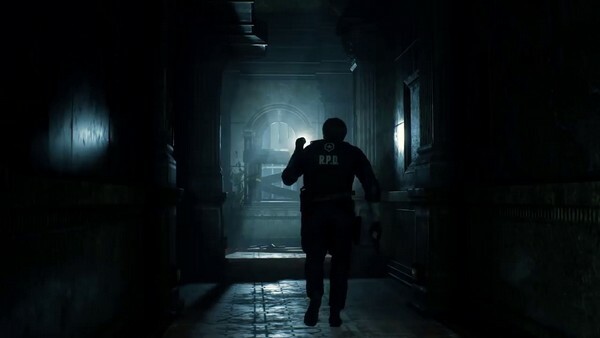 In case of Resident Evil 2 Remake, throughout various trailers and gameplay showcases, it looked extremely stunning and gross (in a good way). And thankfully, that is exactly what Capcom delivered to the final version. 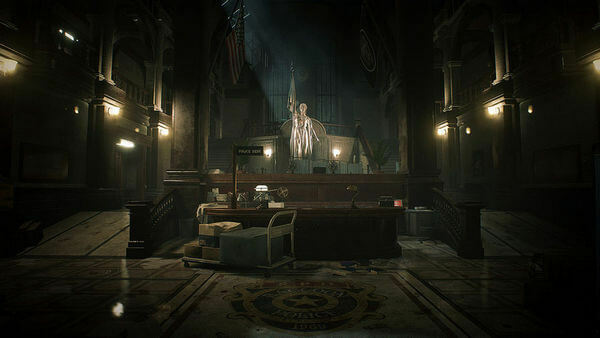 Similar to its demo, you can expect the same high-quality visual in Resident Evil 2 Remake. Everything looks so detailed; it looks new, yet reminiscent at the same time. It feels really fascinating seeing how the technology has developed within the past 21 years, especially for those who have played the original 1998 Resident Evil 2. Then there is another fascinating aspect which is character’s model and facial animation. Back in the old day, Resident Evil 2 does tell a proper story; however, the limitation of technology made it really hard for developers to tell the story exactly like how they imagine. This especially applies to facial expression which was… rather pale and frankly speaking; it was difficult to convey emotion to the players. But coming to this new Resident Evil 2 Remake, we cannot help but to admire the huge leap of facial expression in this game. Take officer Marvin Branagh as example, he looks lots more details and his facial animation looks so emotional and real. He looks so good that some people may mistake him as a real-acting human if they just take a glance at the in-game cinematic. Sound has always been one important aspect of any horror game. It is essential to create a creepy, scary atmosphere, and to make players feel afraid – an emotion which any horror game wants to bring out. And in Resident Evil 2 Remake, it is simply fantastic. First off, we have to talk about the ambiance, the background “music”. To enjoy it fully, just put on a headset and you will immediately feel the uneasiness “thanks” to the surroundings sound. The music is really creepy and unsettling, and when the hell finally breaks loose, it keeps pushing players on edge since they don’t know what will happen. The zombie’s sound is also really well made. And for some reason, it sounds much more terrifying here due to the fact that zombies are much harder to kill, especially when you play in higher difficulty. When we hear the sound of those zombies which trying to chase us, we really feel nervous and we just want to get away from those as soon as possible, rather than trying to confront them. It is really fascinating when we think about this because nowadays, people are so used to horror-game genre. The fact that this game can deliver such uneasy environment and sound is no-doubt a massive success. So what about voice-acting then? 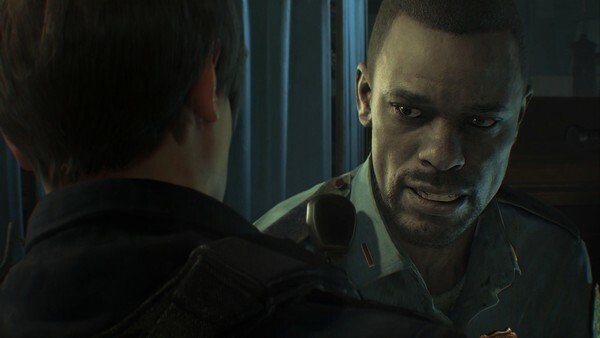 In general, we really like the new voice-acting in Resident Evil 2 Remake. Most characters have really good voice-acting and they do sound convincing. Again, Marvin Branagh is a great example here. His voice and dialogue sounds really good and he can convey much better emotion than his 1998 RE 2 version. The only offset here is Leon’s voice and dialogue which feel kind of… cheesy and over-reacting. On the plus side though, hearing Leon’s voice is a fun reminder of the good ol’ day when people first played Resident Evil 2. As mentioned, Resident Evil 2 Remake is a re-imagined version of 1998 Resident Evil 2 and therefore, obviously the game will have the same main storyline like Resident Evil 2. This also leads to one important question: Is this game still enjoyable for those who have played the original RE 2? The answer is absolutely yes actually! As we mentioned before, back in the day the technology limitation did hinder developers’ capability to tell the story exactly like how they wanted to. But with the latest RE Engine (the same engine used for Resident Evil 7), they can now do so much more things to tell this story from a new perspective. Although the base story still remains the same, there are actually lots of new stuffs going on in RE 2 Remake. They have included new information, lore, and story bits throughout the course of both Leon and Claire’s campaign. Even if we exclude the new stuffs, the old story which we have already known also got re-told in a new way (like officer Branagh who gets portrayed in this game like a hero to Leon). The storytelling is still really enjoyable even if you already know what’s gonna happen. Interesting enough, the Zapping System which implemented in the original RE 2 is now removed from this remake. Instead, players will continuously follow each character’s main campaign. The first campaign will follow Leon’s storyline and after completing his campaign, players will unlock Claire’s campaign which also takes place in similar area, yet with different story and puzzles. Both Leon and Claire’s storylines are really well told. In Claire’s storyline, everything still feels fascinating and fresh despite the same areas. Right off the bat, one major change we can see in terms of gameplay is the camera. 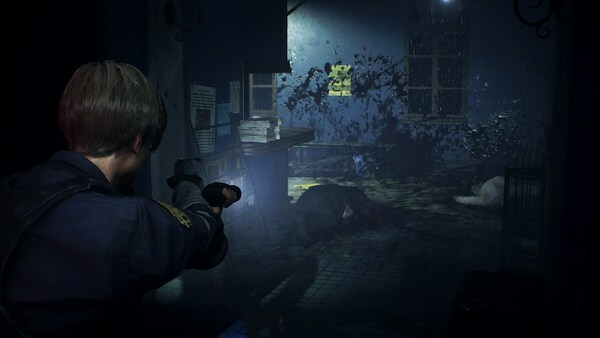 Unlike the fixed-camera, tank-like control in the original RE 2, Resident Evil 2 Remake adopted the over-the-shoulder 3rd-person perspective similar to Resident Evil 4. At first, this might make some people misunderstand that RE 2 Remake would be more action-oriented game. However, the final game is far from being an action game. It is a full fledge survival-horror game focusing on puzzle-solving, which we will mention later on. 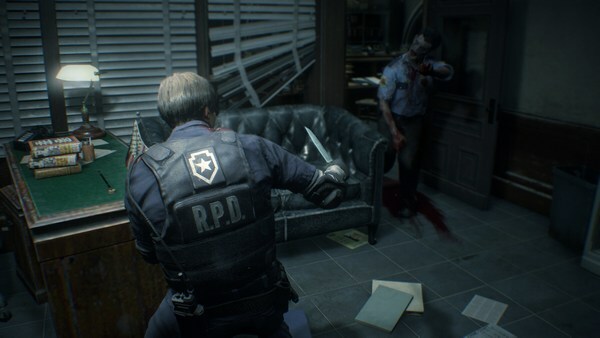 Now to be clear: Resident Evil 2 Remake is indeed one hell of a scary game and that partly thanks to that over-the-shoulder 3rd-person perspective. From this camera angle, it allows players to immerse themselves better into this recreated hellish Raccoon City. It allows players to focus on many details scattered throughout the world. And more importantly, it really emphasizes the claustrophobic aspect. If you have watched various gameplay showcases so far, you will see in many cases, players have to tread through tight, dark corridors. This helps amplifying the insecure sensation from the players. And combining with the disturbing background sound and music, along with the grossly detailed, hard-to-kill zombies, it creates an incredible intense, creepy atmosphere when we walk around in darkness. Of course, we have to talk about the zombies – the main enemies throughout the game. Unlike many current zombie games, these undead creatures in RE 2 Remake are now truly a nightmare to fight against. They are still slow; however, they often gang up against the players from literally everywhere. This works wonderfully with the dark, tight corridor, which can cause a huge panicking when players got grabbed by zombie “out of nowhere”. Also unlike many other zombie games, even the normal zombies in this game are really tough to kill, even with a number of headshots (unless you play in lower difficulties). And so, the best way to deal with them is to avoid them if possible and try to prioritize solving the blocking puzzles. Bullets are not so common in this game and therefore, trying to kill every single zombie is not a viable option. In fact, there are many occasions when we thought that we have killed a zombie, it can still genuinely scare the hell out of us since it can stand up and fight again. So instead, it is more recommended to shoot their legs to handicap them. 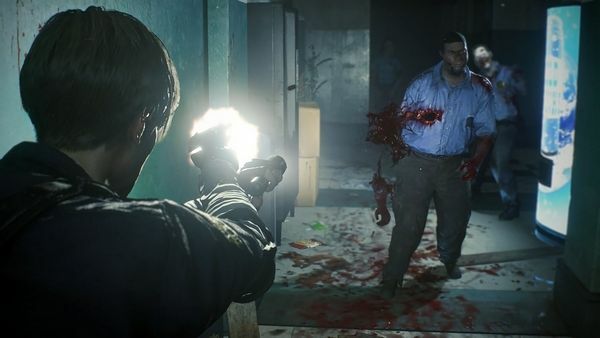 This also leads us to one of RE 2 Remake’s best aspect in terms of technology: players can literally shoot almost every body part of a zombie’s body. We can clearly see the damage caused upon the zombie after every shot. The damage looks so detail and gross, but that is a great thing given the dark nature of this game. With all this explained, let’s get on to other important element of RE 2 Remake which is puzzles. Just like the original, this remake also focuses a lot on solving puzzles in order to progress. Interestingly, most of the puzzles are redesigned to fit the new RE Engine, and also, there are some new fascinating puzzles. Generally, these puzzles are not that hard to solve if we pay close-enough attention. In addition, there is a twist to all this, which due to the spoiler reason, we can only call it a “time-limit mechanic”. Essentially, this mechanic forces players to find the solution to the problem as soon as possible. And while this may sound simple, it is actually a genius idea since it always puts players in a pressure as they cannot fool around and have to keep moving. That said; we understand why this mechanic may be frustrating for certain players who like to enjoy game in slow pace. Finally, this game does include boss fights. However, this can be the weakest part of the game due a number of reasons. To be fair, these bosses look amazing. Their designs are absolutely fantastic and terrifying. Yet, their boss-fight mechanics are kind of counter-intuitive. It feels kind of odd when for most of the time, players have to focus on puzzle-solving and then suddenly, they have to switch to fighting. Not only that, the character control is these boss sections are not exactly agile and therefore, it feels kind of clunky and even un-fun to play. Luckily, this weakness is not that bad to the point of being a deal-breaker, at least based from our experience. Overall, Resident Evil 2 Remake is truly a remake done right. 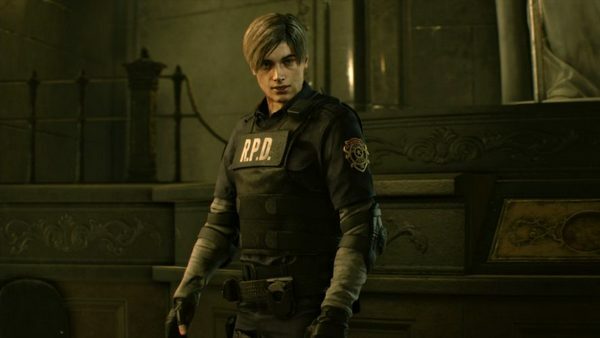 It amazingly captures the spirit of the original 1998 Resident Evil 2, while at the same time, elevates the game to the current day’s standard. It looks absolutely gorgeous and terrifying, it nails the scary, claustrophobic atmosphere. It does have some few nagging points like the clunky boss fight and the cheesy voice-acting from Leon’s side. Even so, Resident Evil 2 Remake still remains as an excellent zombie game and also a love-letter for fans of Resident Evil franchise. For that reason, the final verdict for Resident Evil 2 Remake is an 8.5/10! It is a fantastic survival-horror game, even for those who have played the original RE 2 before. And for that reason, we highly recommend this game if you’re fans of survival-horror games. For now, thank you and stay tune for more news in the future!